You Have Been Watching (TV Special) …Tutti Frutti | Scots Whay Hae! There are works of art that you carry with you, that make you look at life in a different way and hold a significance beyond simply enjoyment or appreciation. I suppose you fall in love with them. For me one of these is John Byrne’s Tutti Frutti. It wasonly six episodes long but it changed Scottish TV, although not as much as it should. It is rare, especially in terms of modern television, that one-man’s vision arrives on screen so fully formed. Alan Clarke, Denis Potter, Stephen Poliakoff and, with his recent This Is England ’86, Shane Meadows, are the exceptions that come to mind. In Scottish television I can think of only two that stand comparison. One is Peter McDougall, and I’ll look at his work soon. The other is John Byrne. 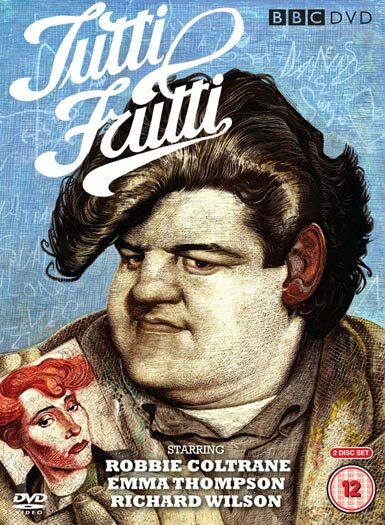 Tutti Frutti managed to both influence and overshadow the Scottish TV drama that followed. Byrne’s own YourCheatin’ Heart and Donna Franceschild’s Takin’ Over the Asylum were personal favourites but no Scottish drama held the same magic as this tale of an ageing rock and roll band. To those who have never seen this I recommend with all my heart. Those who have will understand.